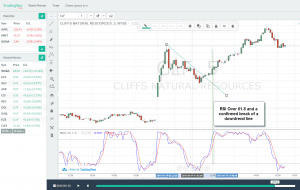 Many of the technical indicators discussed on the Tradingsim blog deal with assessing a particular stock or ETF. However, in this article we will cover the tick index, which is a broad market momentum indicator used to gauge the strength of the underlying securities of the NYSE. The tick index is important, as it will better position us for when we should enter and exit the markets based on a macro view of price action. On first glance, the tick index looks a bit chaotic, but as you learn to interpret the readings, the wealth of information it contains will prove very useful when day trading or swing trading. What is the Tick Index? The tick index measures the short term health of the markets by taking the difference between the number of stocks on an uptick and the number of stocks on a downtick. The tick index sums up this difference for all stocks in the New York Stock Exchange. For example, if there are 2700 stocks on the NYSE and 2000 of them printed an uptick while 700 printed a downtick, the tick index would read +1300. If you take a look at the below chart, it will look like a bunch of noise. However, this notice represents extreme extreme buying and selling activity. That extreme buying and selling displayed by the tick warrants caution or even a reversal in the opposite direction. We want to pay close attention to tick readings of +/-600, +/-800, and +/-1000. We keep an eye on the 600 level as it will signal a possible move to 800 or even 1000. When we are in a losing day trading long position and the tick reaches +800, think about selling out. I use readings of +1000 and -1000 to scale out of all long and short positions and even think about going in the opposite direction. Notice how +1000 and -1000 produced decent intra-day reversals in the S&P 500. The higher the tick readings, the more powerful the reversal signals. Since we have covered the power of the tick index to identify market reversals, I want to now focus on how the tick index can be used to confirm the strength of the market. To this point, we will identify tick readings of +1000/-1000 to confirm bullish or bearish sentiment respectively. This is the daily chart of Bank of America (BAC), from the period of October 2015 to March 2016. Below the chart you see the NYSE tick index chart. The red arrows indicate tick index readings of -1000, which correlate to BAC price decreases. At the same time, green arrows indicate readings of +1000, which correlate to BAC price increases. Let’s start with the first green arrow on the left from Oct 21, 2015. On this day, the tick index registered a reading of +1100. On the same day, BAC increased 1.00%, followed by another 1.00% increase the next day. The next arrow is red and it indicates a low tick index reading of -1060. On this day, BAC dropped -1.3%. On the third arrow, the tick index registered a reading of -1145. Meanwhile, Bank of America’s price tanked -2.87%. This decrease is followed by a further price drop of -2.56% the next day. Notice how the price decreases expanded as the tick index dipped below -1100. The fourth red arrow registers a reading of -1133 on the tick index and BAC sees its price drop -4.83%. In addition, as you can see on the chart, BAC is in a bearish trend at this point. If you compare the BAC chart with other stocks during this time period, you will notice a bearish trend for the months of December through February. Just as it appears the entire world is coming to an end, the tick index registers a solid bullish up day on the fifth arrow. On this day, the tick index gives a reading of +1214 (fifth arrow), which is relatively high. At the same time, BAC stock price increases 3.59%. Then after dropping to $11.00 per share, we see another high tick index reading of +1056 on the sixth arrow; meanwhile, BAC’s price increases 4.18%. This is a turning point for BAC, because it looks like the bearish trend is interrupted. The seventh and last example in the image above is a bullish reading on the tick index. The index registers a reading of +1238. This high reading was also the day BAC’s price increased 4.36%. Let’s now take a look at another real-life example. This is the daily chart of General Motors from October 2015 through March 2016. On the chart you see six green circles and one red circle. These are the exact moments and dates we discussed on Bank of America’s chart. In the green circles, the price action of General Motors mirrors that of BAC. Only in one example, highlighted in red, did the price action not correlate between the two securities. Are you starting to see how individual stocks move in unison with the broad market? If you understand what is going on at the macro level, you will naturally have greater odds of success with your individual trades. We have a bullish divergence between the tick Index and a security when the NYSE Tick shows higher bottoms and the chart of the equity shows lower bottoms. After a bullish divergence between the ick indicator and the stock chart, the price of the security is likely to exhibit a bullish move. In many cases, the reversal is rapid. When an equity price closes with higher tops and the tick index has lower tops, this is a confirmed bearish divergence. 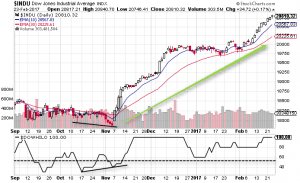 The bearish divergence between the tick and the stock chart signals a potential downward price move. 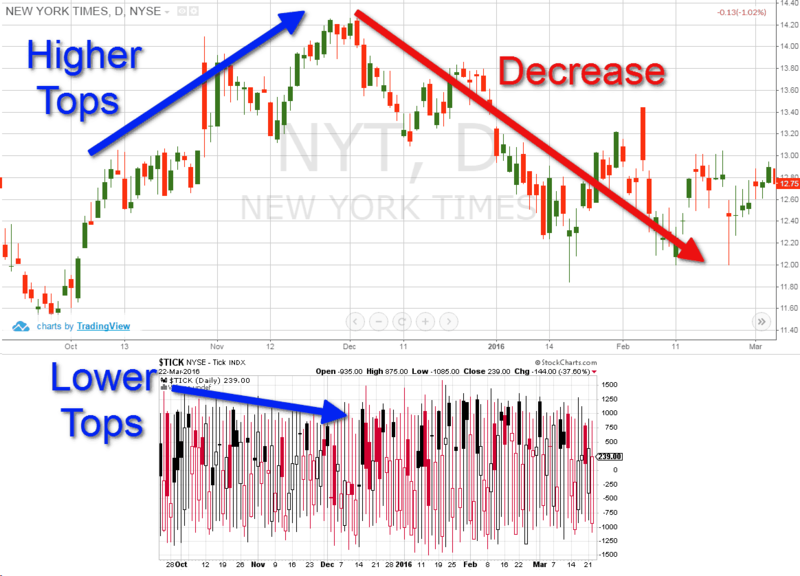 Discovering divergence with the NYSE tick index is a leading indicator before the actual event occurs. Thus we can position ourselves in the market prior to the start of a potential price move. Above is the hourly chart of Twitter from December 2015 through March 2016. Below the chart, we have the NYSE tick index for the same period of time. The image illustrates a bullish divergence between the tick index and Twitter. Notice that for the period January 19, 2016 through February 11, 2016, Twitter has lower bottoms. For the same time period, the tick index has higher bottoms. This confirms a bullish divergence between the price of Twitter and the tick index. After the bullish divergence is confirmed, we see that Twitter experiences a rapid short squeeze. This squeeze lasts for 8 days and results in Twitter’s stock increasing a whopping 35.56%! This type of move is rare, but it illustrates the power the broad market can have on a stock that is oversold relative to the entire market. Assuming a stock like Twitter is not headed for the woodshed, the price action of the stock will return to equilibrium with the overall market. Let’s now review a bearish divergence example. This is the daily chart of the New York Times (NYT) from October 2015 through March 2016. The chart is supported by the NYSE tick index in the bottom of the image over the same time period. The New York Times stock chart shows higher tops form October 2015 through December 2015. For the same time period, the NYSE tick index indicates lower tops. This confirms a bearish divergence between the tick indicator and the New York Times price chart. As a result, in the beginning of December, the NYT price begins to decrease. Over the next 45 days, the New York Times drops 17%. While this is smaller than the price run up of Twitter, it is still sizeable. First, never to rely solely on the tick index. Make sure you always confirm your tick signals with an additional trading indicator. Secondly, the more periods you take into consideration on the tick index, the more reliable the signals. Let’s take the tick divergence as an example. If one day the tick index registers a high reading, while the price of a security is decreasing, we have a bullish divergence. However, daily discrepancies are likely occurrences and shouldn’t be given too much weight. Now, imagine if the price of the security is decreasing for a longer period of time and at the same time the tick index is steadily increasing. In this case, due to the longer periods of divergence, there is a greater likelihood the security will experience a short squeeze at some point. If you are trading a security based on a tick index signal, make sure you confirm the price behavior with another stock in the market. This way you can validate the security is performing relative to its peers and not experiencing some sort of anomaly. The NYSE tick index is used to confirm potential price moves of the broad market. The tick index can also be used to confirm divergences in stocks. Values of +800 and above or -800 and below are considered strong and reliable. The tick index is not a standalone indicator. The more periods you use as a signal on the tick chart, the more reliable the reading. If you want to take a trade based on a signal from the tick index, make sure you check the behavior of other stocks before placing any trades.